Healthy onions, starchy potatoes, and rich mackerel make a deeply satisfying combination in this one-dish meal. The juices from the roasted mackerel meld with the vegetables to create a subtly sweet, flavoursome paleo dish. Preheat the oven to 400 F ( 200°C). Using a sharp knife, slash the skins of each side of the mackerel and season well. Put a few lemon slices, potatoes, carrots, onion and garlic cloves into the cavity of each fish. 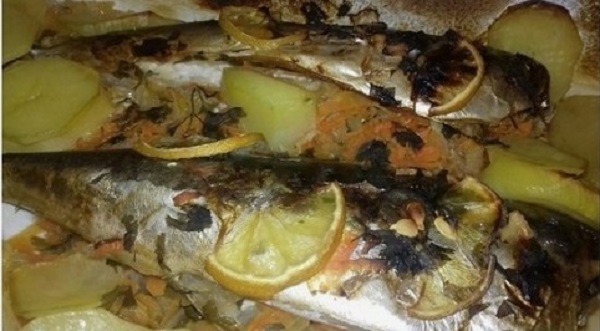 Put the remaining potato, carrots and onion slices on a roasting dish and place the fish on top. Place in the oven and cook for 40 minutes. After 40 minutes take out the foil, and bake another 30 minutes uncovered.